This is the first of a planned series in which I interview friends and family about their attitudes toward money. Most of these will be anonymized (and much shorter). Some will not. This first interview is with Scott Durbin, a member of Imagination Movers, a rock band for kids. This band is an entrepreneurial venture that required a huge leap of faith. Scott, what made you and the other Movers decide to form a band? And why a band for kids? Once you get into your 30s, you begin to feel opportunities to be creative evaporating. This time in our lives is often devoted to starting families, working for the company, paying bills to stay above the proverbial water, or working on our various relationships (wife-husband, boyfriend-girlfriend, other). I could get philosophical about the conflict and guilt of doing something seemingly self-indulgent versus being a good father/husband/worker, but let's save that for another day. Luckily I have an amazing wife! 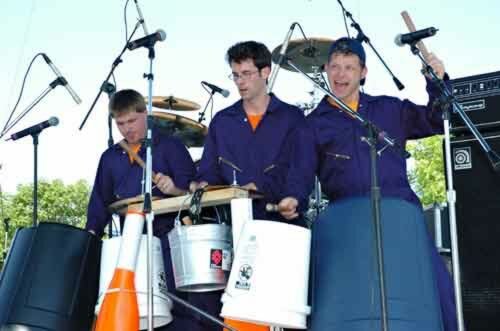 Several forces led to the founding of the Imagination Movers. 1. First, the guys in the group are very creative fellows. Creativity bubbles to the top given an opportunity. 2. Strangely enough, having families created an environment that allowed us to pool our creativity. That and proximity. When the Movers started, we lived within walking distance from one another. We all started having kids at the same time (minus Smitty who is the Mover without children). Kids have birthday parties. Parents gather. A ritual is established, and instead of going to bars or wherever to hang out with your mates, you're left with your two-year-old's birthday party as a means of convening. But it's all good. These gatherings became the second peice of the puzzle. 3. When you have kids, you are immediately introduced into a foreign culture. You acclimate yourself as best you can, discovering the latest coolest educational toys, kids' music, enrichment opportunities, places to play or visit, restaurants where kids eat free, any video/audio that might make your kids smarter — the whole kit-n-kaboodle. You discover your children want to listen to something over and over and over and over and over again, so as a survival parent, you want to make sure you can tolerate whatever that music is. This was the third key to development of the Imagination Movers. 5. Finally, I am a huge fan of Mister Rogers and Captain Kangaroo — people who possess a sincere desire to better the lives of their audiences and an almost palpable integrity that assures you they are not full of crap. And on top of that, they are REAL and not cartoons. I love cartoons just as much as the next guy, but heck, you know live action children's entertainment is needed. A cartoon can only model so far or translate so much. It's two-dimensional. So when Fred Rogers passed away, I felt called to take his place. Sounds crazy, but that become this nagging gut thing for me. I wanted to create a local kids' show that treated kids like people and not consumers. This was the last factor in the band's creation. I mention that I want to start a local kid's show to my wife's friend at the local PBS affiliate. I talk about the idea with my friends (and future Movers) at parties or the local grocery (the neighborhood essentially). As I begin waxing, I arrive at a name for the show — “Imagination Movers” — and a broad concept that Movers work in the other-worldy land of imagination, and it's the job of a Mover to bring people good ideas when they have idea emergencies. I pitch the initial notion to the guys at a party. They're in. We start writing a treatment/script in the attic of Dave's house that we plan to pitch to the local PBS station. As we work on the show, music becomes a cornerstone. Rich and Smitty whip out the guitars and jam. Since the first script is about ‘healthy snacks', most of the songs are in that vein. Well, we start writing songs and sometimes play them at get-togethers. People love the songs. Really love the songs. We pitch the show to the local PBS affiliate and they love it, but with PBS-type entities, they have NO money. We are disappointed, but everyone loves the songs. So Rich decides to invest in a home studio and we begin recording the music we wrote for the show. The rest is Mover history. So why did we become a kids' band? For the most part, our children/families were where we were, and what we were about, so our songs became part observations of our lives, part honoring our wee ones (and hopefully creating something meaningful for other wee ones), and a sincere desire to be the new Mr. Rogers. But in our case, Mr. Rogers has been divided into four parts, and instead of wearing a cardigan … wears blue coveralls. What was your family's financial situation at the time you started the Imagination Movers? At the time the Movers started, I was entering my sixth year of teaching. Picture if you will, being the ‘bread winner' on a teacher's salary. Ahhh, the luxury of it all. My better half worked full time-ish as an office manager for a web firm and was earning a little less than me. Our income, however, was supplemented by a rental property. Even so, we rented to friends and consequently asked for $150 month lower than market value for the area. Having two wee ones, we were quite honestly living paycheck to paycheck. We had some credit card debt but nothing crazy. Our biggest financial problem — and this sounds strange — was vacations. Here's the recurring scenario: we would finally get ourselves into some kind of financial stability and then boom, we would go on a family vacation and put ourselves right back into a mini-hole. Not trying to shift blame from self, but ‘we' were not as frugal when it came to vacations as we should have been. My wife having been raised in a close knit family that always took summer vacations, was pretty adamant that we take similar family vacations. The problem with vacations is that you're more apt to splurge thus obliterating your vacation budget. It's the mentality of saying to yourself, “Hey, we're on vacation! We won't be able to do this for awhile or eat this good or whatever.” And soon enough, your food budget no longer exists and you're stuffing your face with $20 crab cakes. Viva la vacation! How did starting the Imagination Movers affect your personal finances? For a while, everything we did was out of personal pocket. As the organic nature of our project began to take root and blossom, it was clear that some kind of real investment needed to be made so our Big Ideas could be realized. That investment was a gut check: it meant we needed to use more of our own money. So began the Movers. Honestly, everything we did — from purchasing blue suits to buying equipment (such as a PA and wireless mics) to investing in a home studio — came from the pockets and sacrifices of Rich, Scott, Dave and Smitty. The great part is that we so believed in what we were doing that money, time and energy aligned themselves and we went into overdrive. All in all, to get the Movers started, we had to get out the shovel and dig into savings so the machine could begin to turn. Our first big hope was that sales from the CD and early shows would allow us to reap what we sowed. Either we'd get back what we paid into the project, or allow the money we made to lead us to other opportunities. The latter became the yellow brick road. So to answer your question: my personal savings was hit, parts of my home were converted (putting up shelves for inventory, setting up a network system, getting filing cabinets), and little costs (mailers, paper, postage) sometimes cut to the bone. Instead of buying a six pack or going to a movie, my disposable income went to buying CDs and labels to burn early demo copies for people. How did you and the other guys feel about this? It sounds to me exactly as if you've been starting a business. Do you feel this way too? We had big ambitions from the start. Although it seemed like a great side project, we secretly treated it as an opportunity to become self-employed and as such worked it like it was a small business. I took on the role as visionary, aspiring to some very lofty goals. When our demos turned into real products, the fire was lit and we added more goals: creating a coloring book based on one of the songs, printing t-shirts, looking to establish distribution for our burgeoning product line. You name it, and we were plotting it. We even financed a trip to Toy Fair in New York in an attempt to introduce the world to the Movers. I will say we were smart about resisting investment from outside of the group. Some financial advice we received led us to just say no to third party investors. I remember something about us selling securities in the group if we did so; in other words, we'd be opening ourselves up to a very complicated financial and legal world. We also had some great friends who encouraged us to form a business plan. Sounds incredible impetuous, but we formed an LLC, met with local business leaders (Idea Village, a business incubator in New Orleans), and started working on goals. Naturally, guys in the group participated in the project as best they could. Some did much more than others, but we were aware of the sweat equity certain people were giving early on. Rich and I were in working situations that allowed us to devote more time to the project than Dave and Smitty. Dave was working hard as an architect and Smitty as a fireman. We were — and still are — doing something that we loved, so turning it into a business simply allowed us to keep everything on the up and up, as well as kept us organized. Scott, how did Hurricane Katrina affect the Imagination Movers? How did it affect your personal financial situation? Katrina, without question, was a reminder of just of fragile we are; how life can turn on a dime with very little warning. Its effects were truly devastating, but with destruction there comes new life and so it was with my family personally and the Movers professionally. First off, Katrina destroyed three Mover homes and most (if not all) possessions. Here is a picture taken near our home a few days after the levees broke. Keep in mind, most of this water stayed around for days. 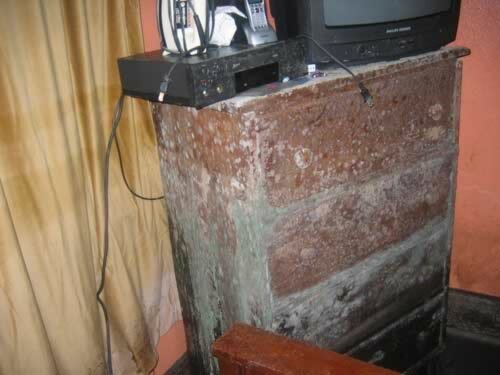 Sadly enough, photographs, videos of a child's birth — you name it — met a watery and moldy grave. Actually, it went further than that — it destroyed the neighborhood. The places you went to have coffee, ‘make' groceries, the church you attended or the school you dropped your kids off were gone. In the blink of a wink, everything you saw for miles became ghost-like. Even today — more than a year plus after — empty houses, lonely streets, lost neighborhoods now whisper for anyone, anything to bring them back to their former selves. The Mover office was also trashed. Countless CDs, coloring books, musical instruments were ruined. And guess what? The Movers didn't have insurance. We had liability insurance, but we were so small and Mom-and-Pop-ish that we hadn't needed more insurance — or so we thought. Luckily Smitty lived on the West Bank, so although his home experienced minor wind damage, it escaped the destruction. The material things naturally hold memories, but not life and our thoughts focused on the well being of him and others like him soon after Kat hit. Right after the disaster, everyone was reeling from the new reality we were forced into and for all intent and purpose had not processed the extent to which our lives would change, but we knew at the very least we did have the Movers. In particular, the Movers had two shows booked in Texas, one in Dallas on the Labor Day weekend and another in Plano. With the exception of Smitty (who was knee deep in search and rescue), we all rallied and went to Texas to fulfill our obligation. Quite honestly, no one knew about their jobs or future income or anything. All we could see in front of us was a small payday and so we went with quite honestly the clothes on our back. We had no instruments, no Mover suits — nothing, but we went. And we played. Here is a picture of the Mover suits we used in place of our trademark royal blue ones. Note: Kyle is our ancillary Mover and plays drums for live shows with us. Life afterwards was surreal. We no longer had a place to live. My family lived with my parents and my brother and his girlfriend in a tiny house with one bathroom in Lafayette, Louisiana (about two hours west of New Orleans). My job as a teacher was in limbo. I spent time in line for food stamps and wondered what queer curiosity tomorrow would bring. All the while I was still a dad and husband and the well-being of my family was paramount to everything I did. I'm sure the rest of the Movers felt the same way. Personally speaking, my family received help from people we knew and didn't know. Friends sent us giftcards for bookstores so we could buy the kids books as our wee ones love to read. Other friends and people we didn't even know sent assistance of clothing and toys and hope. Churches helped. Companies helped. People helped us restore the basics. The Movers too received emails of support and even a guitar was sent. The emails, for the Movers sake, really kept the project going. The simple act of someone somewhere taking the time to share with us how important what we did — musically speaking — meant in the lives of their children (many whom were going through the same situation as us) humbled us. Buckled our knees. We knew. We knew we had to continue despite the overwhelming sense of powerlessness we all felt. On the good side, the reality of our immediate financial situation was: we forced ourselves to save, to tore up those proverbial nuts for winter. Some pluses included no longer having to pay some of our bills: electric, cable, water, etc. We did receive some emergency funds from Red Cross, FEMA and some monies from of our insurance companies. All in all, our financial situation was made very clear to us: the ins and outs of our money was front-and-center and we were forced to deal with our financial situation head on. Credit card debt — what to do about mortgage payments on a home we no longer lived in — paying rent, too — you name it. We dealt with how we were going to handle it, especially having lost my salary. Since I had no job, the Movers became a full time gig. As it did with Rich and then later with Dave. Any reason we had not to jump headfirst into this venture disappeared and so we signed with Disney. What a crazy juxtaposition that is — you sign a deal with Disney and you still are having difficulty making ends meet. Most people believed we were rich once the Disney deal came — biggest misnomer you could ever imagine. Hopefully our financial situation will improve, but the fact is: reality and perception are clearly two different things. Our main source of income is not Disney. Instead it was and is playing live. It's our favorite thing to do and so we do it — right now to survive financially and emotionally. As a sidebar: Major props to Music Rising as it was a Godsend. Without it, the Movers would be instrument-less. 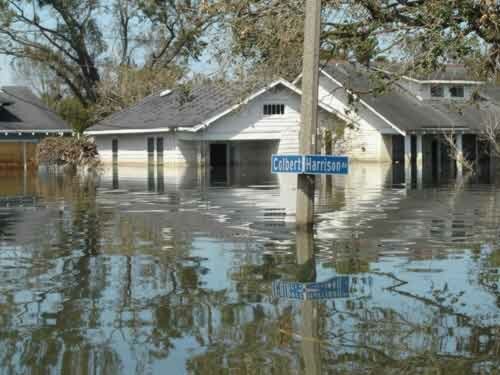 It's now been a year since Katrina. How are things now with the band? With your financial situation? A year plus removed from Katrina, it seems everyone yearns for routine and normality. My life now is spent in a city two hours west of New Orleans. I am the only Mover who has not returned to NOLA. My family sold our house after having sat on it, hoping the city and state would give us reason to reinvest and rebuild. Translation: a plan of some kind or another. Unfortunately, they have failed miserably in my humble opinion. The local leadership has become invisible and crime has riddled a city in desperate need of hope. The world wonders why the Saints meant so much to the city of New Orleans. The inside scoop: a simple football team allowed the city to be one, regardless of color or creed or financial state. It allowed all people to smile and be hopeful because the city itself didn't offer those commodities. Back to the Movers — We've been fortunate to have videos rolling on Playhouse Disney so it does raise our profile. We've been working our tales off to make half of what we were making as professionals: architect, journalist and teacher — so we could make this dream come true. Sidebar: Smitty still works as a fireman in New Orleans. Shows you our true reality. Even with that said, we have opportunity and that is all we can ask for. We finished a pilot presentation (we felt was incredible) and five new videos which will hopefully air soon. All of the filming was shot in LaPlace (which can be considered Greater New Orleans to some). We felt humbled to know that an idea we created was now employing 75-ish people, most of whom were from the local area. Good story. Gives you lumps in your throat. As I type this, I really have no idea what the future holds — financial or otherwise. I just hope I can make my next payment! Money is, after all, like all the things lost in Katrina: it comes and goes. A person defined by money gets short-changed by life. Family and friends are what make life special. Thanks to Scott for sharing his story. Look for more money interviews with other real people in the coming months. Want to hear what the Movers sound like? Here's a song called “My Favorite Snack”. This song is popular among both the kids and parents we hang out with. You can find more mp3s for download at the Imagination Movers site. Scott reports that the group has a brand new CD coming out on a major label in March. Want to hear what the Movers sound like? Here's a song called “Clean My Room” that — among other things — reminds me of Aerosmith's “Sweet Emotion”. You can find more mp3s for download at the Imagination Movers site. Thanks to Scott for sharing his story. It's a great example of the need for emergency funds and the realities of entrepreneurship (and making money from hobbies). I hope to do more money interviews in the future. I'm exploring the idea of making these podcast-based. If you have any thoughts on this, drop me a line. There are 4 reader responses to "Money Interviews: Imagination Movers". How timely! I just got turned on to the Imagination Movers by my 10 mo. old son’s Music Together Teacher. She played some of their stuff before class and a couple of the songs sounded like my kind of music, but with kids’ lyrics. 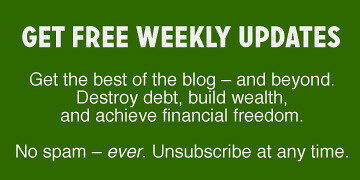 A month or so later, I started reading this site after a link I found on Make Love, Not Debt. I love when two seemingly disparate things become intertwined like that. Though I suppose having kids does make one think about saving money. . .
My daughter loves them! I can’t wait to read the rest of the interviews. I grew up in that neighborhood (2 blocks from the Colbert and Harrison Ave pic above). Moved to Portland in ’95. It makes me sick to hear Scott’s story, a story told by many of my friends and family in NOLA. It also makes me happy to see Scott’s attitude and hope for the future. I have no doubt he’ll bounce back and be successful. Good luck Scott and have a Happy and Safe Mardi Gras. Kudos to Scott and Movers, for persevering through all of that, to do something good with their talent. From the looks of the Imagination Movers show on Disney, things seem better for the band now. Can we have an update?